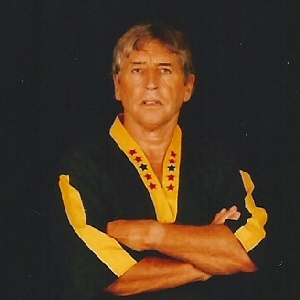 Jim is the Founder and Chief Instructor at the Jim McAllister Academy of Martial Arts and presently holds the rank of 7th Dan Shihan in Fudoshin Karate. He was awarded the rank and given the title of Professor by the late Professor Lawrence in 2003. He is now in charge of the B.F.A. Worldwide. Jim was awarded his 8th Dan (hachidan) in bu-jutsu (martial techniques) by TradKa UK on 12 May 2012. He is a 7th Dan in Kick-Boxing by the B.F.K.B.A. and 7th Dan in Kick-Boxing by the B.N.M.A. He is also recognised as a 7th Dan in Martial Arts by the World Wide Martial Arts Association and the A.M.A. In addition to this he holds a 4th Dan in Sessen Ryu Karate and is the UK Representative of the National Karate Association of America. He began his training in the late 1960's as a traditional Boxer. After five years he went on to study Karate and received his first black belt in 1974. After training for many years in Karate and obtaining Black Belts in three other systems, he toured the world in search of new ideas and trying to find a system which suited his requirements. He was introduced to Sensei Ian McGarrity, and was impressed by his ability, humbleness and skill. Ian went off to Japan to live, and recommended Jim train under his Sensei (Professor Lawrence) Jim started his new martial arts career in Fudoshin Karate, and although Professor Lawrence accepted Jim as a student, he did not accept his grades and so he started again at White Belt. He was awarded his Black Belt in the Fudoshin System in 1983. It was only when he was introduced to the Fudoshin System that he felt he had found a system/style that suited him. Then in the mid 1980's he was introduced to Kick-Boxing. He found Kick-Boxing had the contact side that he felt he was missing in his Martial Arts career. For a while his Karate took second place, but came back when he realised that the Fudoshin spirit, method and knowledge could be incorporated into his teachings of Kick-Boxing. He has studied in America under ex World Middleweight Champion, John Longstreet, Thai Boxing Coach, Lincoln Boney and World Karate Champion Kevin Brewerton. But his main influence is a Chinese Master, Master Kam, who is the most introverted of all the Instructors, but without doubt one of the best.